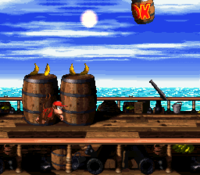 Gangplank Galley is the third level of Donkey Kong Country 2: Diddy's Kong Quest. It is located on the Gangplank Galleon. Not only does this level bring back Zingers, but it also introduces Kaboings and Krunchas. 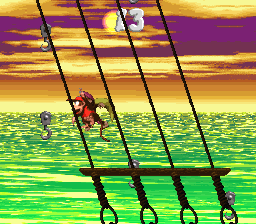 There are hooks as well that both Diddy and Dixie Kong can grapple on to, along with tall stacks of barrels for them to climb to grab bananas, Banana Coins, and other items. In the original version of Donkey Kong Country 2, the water in the background strangely appears to be green, but in the game's remake, it takes a more grayish color. Additionally, Invincibility Barrels make their first appearance here. Diddy Kong runs in front of some large barrels. The Kongs begin the level in front of a large pile of barrels with a Bonus Barrel on top of them and a few hooks to the right of it that hang above a Banana Bunch and the level's DK Coin. In front of the barrels, the primates can find a Kaboing and a pair of ledges with a Klomp between them. A few barrels are stacked up ahead of here that the Kongs can climb on to reach a few bananas and a DK Barrel, which is followed by a small stairway that a few Kaboings hop along. At the top of the stairs, the heroes can find a treasure chest that contains a Banana Bunch. After they travel down an additional stairway, they come up to a few barrel platforms with two Klomps on top of and in front of them. The barrels can be climbed on to aid the heroes in reaching a higher ledge with a hook above it that hangs next to the letter K.
If the primates continue from here, they come down another small stairway with a few Kaboings on it. A pair of barrels is at the bottom of the stairway that can be used to reach a trio of hooks that can be climbed to reach a DK Barrel and the bananas under it. A treasure chest that contains a red Extra Life Balloon is also under the DK Barrel, which is followed by a ledge with a Neek on top of it. The heroes can spot a trail of bananas leading upwards near the rat enemy, and a hidden Barrel Cannon is above it that can shoot them onto a tall stack of barrels. Two more tall piles of barrels are after this stack, and between each of them is a hook with a Banana Bunch or the letter O below it. If the primates do not travel along these barrels, they must instead travel through a lower part of the ship that is full of Kaboings. After they climb out of this lower area, they come up to a Neek and a barrel platform that is followed by a small ledge with a Banana Coin-containing treasure chest at the bottom of it. Once the Kongs climb a small stairway with a Klomp at the top of it, they can discover a Star Barrel. The primates can find a large set of barrels at the bottom of a stairway located after the Star Barrel. A Kruncha and the letter N are above the barrels, while a Klomp and a DK Barrel are in front of them. After the heroes climb to the top of a nearby stairway that Neeks march along, they come up to a wide abyss that they can cross with the use of a hook floating over it. On the other side of the pit, there is a treasure chest that holds a Banana Bunch. It is followed by a large group of barrels that form two rows. A Kruncha is on each of the rows, and an additional Kruncha marches in front of the barrels. Another wide abyss follows here, and it contains two hooks that the heroes can use to cross it. They can find an Invincibility Barrel on the other side of the pit that makes them invincible for a limited amount of time when they hit it. 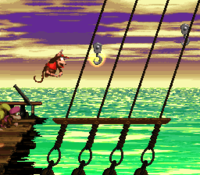 Diddy Kong jumps to some hooks that hang over an abyss. A stairway follows the barrel that a few Neeks march along. Two pairs of large barrels are ahead of here. While the first pair stands behind a Kruncha and holds a few bananas, the other supports a Kruncha and sits behind some bananas. A Banana Bunch is located to the right of the second barrel pair, and a small stairway with a Kaboing on it is below it. On the bottom of these stairs, the Kongs can find a large stack of barrels that hold a few Krunchas, a treasure chest that holds a red Extra Life Balloon, and two bananas. A Bonus Barrel is also above it. Once the Kongs head past the pile of barrels, they make their way up a set of stairs with a few Kaboings on them and then approach a wide abyss with some hooks above it. Once they cross the pit, they come up to the End of Level Target. If they jump on the target from the ground, they simply complete the level, but if they jump on it from a nearby hook, they complete the level and earn a prize. The Kongs can find three Banana Coins hidden beyond the End of Level Target. Banana There are 167 Bananas located throughout the level. Banana Bunch Coin There are 6 Banana Bunch Coins located throughout the level. DK Barrel There are 2 DK Barrels located throughout the level. Treasure Chest There are 4 Treasure Chests located throughout the level. Red: Inside a Treasure Chest before the second DK Barrel. Red: Inside a Treasure Chest after the Invincibility Barrel. Red: On the End of Level Target's roulette. Invincibility Barrel An Invincibility Barrel is found after three Krunchas and two hooks. The first Bonus Level is located at the beginning of the level. The Kongs must climb to the top of the pile of barrels right next to the start of the level and jump into a Bonus Barrel located above the highest barrel, which sends them to a Bonus Level when entered. Here, they need to throw several treasure chests at a red Zinger to break them open. They have only 10 seconds to find which one contains the Kremkoin. Once they break the correct one, they can grab the special coin with the remaining time. The second and final Bonus Barrel is near the end of the level. 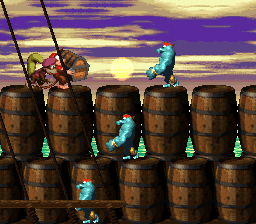 After the primates cross the big gap with the two hooks over it, they must hit a nearby Invincibility Barrel, and then go to a huge pile of barrels with Krushas on them. The Kongs must make their way up, destroying every enemy in their path with their limited invincibility powers, and soon jump into the Bonus Barrel at the top of the area. They can also reach this Bonus Barrel with the use of their Team-up move. The Bonus Barrel transports them into a Bonus Level, where they must swing hook-to-hook to cross a wide pit until they reach the Kremkoin. They have only 15 seconds to collect the Kremkoin. Next to the first hook in the level. After the Kongs pass the second DK Barrel in the level, they can find a trail of bananas near a tall stack of barrels. Using their Team-up move, they can throw one another above the bananas and into a hidden Barrel Cannon that can blast them onto the tall stack of barrels. A few more piles of barrels are ahead that the primates can jump along to find a Banana Bunch, a Banana Coin, and the letter O. Above a pile of barrels located near the third DK Barrel in the level. Shortly after passing the Invincibility Barrel, the Kongs reach a treasure chest that they can throw at an enemy to break. It contains the letter G.
DK Coin The DK Coin is near the first Bonus Level. From where the barrel leading to it is, Dixie Kong must hover to the right with her Helicopter Spin to grab onto a hook in the air. As she swings along some hooks to the right of this, she comes up to the coin. Diddy Kong can also reach this DK Coin in the Game Boy Advance version if he uses his roll-jump ability. Golden Feather (GBA version) The level's Golden Feather is under the ship. To get there, the Kongs must go to the first gap in the level and have Dixie hover down to the left, where can find a barrel. It can shoot the primates through the inside of the ship, where they grab three Banana Coins, some bananas, and the feather. The Kongs should use their team-up move to the right of the first Bonus Barrel to reach a Warp Barrel that is hidden above it. The barrel sends them to Bonus Level, where they can find several bananas in a ship-themed area. 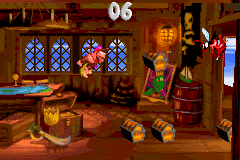 If they walk through the doorway to the right of the bananas, they are taken out of the bonus and onto a hook located immediately before the End of Level Target. Dixie jumps between hooks in the Game Boy Advance version. German Schiff Ahoi! Ship Ahoy! This page was last edited on April 6, 2019, at 01:50.